POLL: Are you collecting the Kennedy dollar? After writing the post “Congress should leave well enough alone” I began to wonder how many people will collect the John F. Kennedy dollar and the Jacqueline Kennedy First Spouse gold coin. After all, the U.S. Mint is expecting higher sales for these coins. Let’s hear what you think. If you want, you can add a comment to this post. To make sure your comment is published below, keep it “family friendly” and do not spam. Even if you disagree with me, I would love to know what you think! Will you buy the John F. Kennedy $1 Coin? Kennedy dollar image courtesy of the U.S. Mint. WASHINGTON, D.C. (U.S. Mint) — Mintage limits for the First Spouse Gold Coin Program for 2015 have been set. 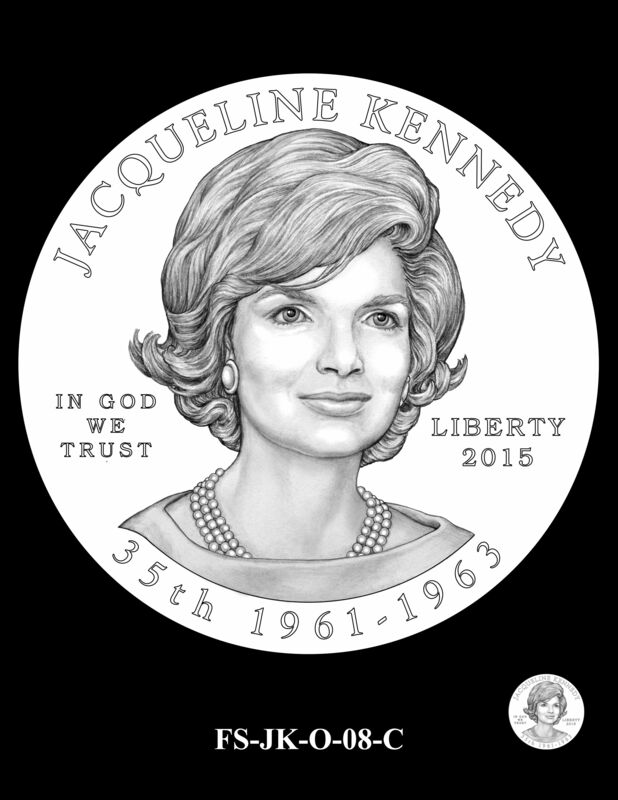 In 2015, the coins will honor Elizabeth Truman, Mamie Eisenhower, Jacqueline Kennedy and Lady Bird Johnson. The combined maximum issuance of proof and uncirculated qualities will be 10,000 for Truman, Eisenhower and Johnson. From 2011 to 2014, sales have been similar, with fewer than 7,000 coins sold. Based on this trend, it is likely the total sales in 2015 for each of these designs will be similar to sales in previous years. For Kennedy, in addition to being renown, the release of the 2014 50th Anniversary Kennedy Half-Dollar Gold Proof Coin may cause a sharp increase in demand from customers seeking to make special Kennedy gold sets using both the 2014 50th Anniversary Kennedy Half-Dollar Gold Proof Coin and the 2015 Jacqueline Kennedy First Spouse Gold Proof Coin. To account for this potential variable, we believe a maximum issuance of 30,000 coins would allow flexibility to increase production should customer demand exceed forecasted sales volumes for the other designs. These maximum mintage limits will be divided between coins with proof and uncirculated finishes based on consumer demand. The Mint is not obligated to mint, and will not mint, to the maximum mintage limits unless it is supported by public demand. The production process and maximum mintages give us flexibility should there be a surge in demand over previous years. When the Presidential $1 Coin Act of 2005 (Public Law 109-145 [GPO: Text/PDF]) was passed, I was concerned that the minting of the First Spouse 24-karat gold coins would not be a success. With the price of gold soaring over $600 per ounce for the last few years and the requirement to use domestic sources of gold, it was speculated that the coins would cost over $400 each. Eventually, the US Mint priced the proof coins at $429.95 and the uncirculated coins at $410.95. Would people buy the coins at these prices? The Mint has never had a program like this making it difficult to make the comparisons against other US Mint products. There have been other gold coin programs and the American Eagles are produced in gold, but the First Spouse coins are the first 24-karat fractional gold series. It would even be difficult to compare these coins with the various commemorative coin programs that have not been successful. Thus, the Mint is charting new territory. With a production limit of 40,000 for both proof and uncirculated coins, the Mint has sold out of the Martha Washington and Abigail Adams First Spouse Gold Coins after two days of being available. It is difficult to tell whether this is the result of first issue sales or there is a genuine interest in these coins. Only time will tell.